The "Queen City of the Ozarks"
Springfield's nickname is "Queen City of the Ozarks" and it is known as the "Birthplace of Route 66". It is home to three universities, Missouri State University, Drury University, and Evangel University. 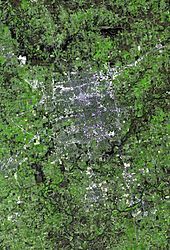 The origin of the city's name is unclear, but the most common view is that it was named for Springfield, Massachusetts by migrants from that area. One account holds that James Wilson, who lived in the then unnamed city, offered free whiskey to anyone who would vote for the name Springfield, after his hometown in Massachusetts. "It has been stated that this city got its name from the fact of a spring and field being near by just west of town. But such is not a correct version. When the authorized persons met and adopted the title of the "Future Great" of the Southwest, several of the earliest settlers had handed in their favorite names, among whom was Kindred Rose, who presented the winning name, "Springfield," in honor of his former home town, Springfield, Tennessee." "The town took its name from the circumstance of there being a spring under the hill, on the creek, while on top of the hill, where the principal portion of the town lay, there was a field." The presence of the Native Americans in the area slowed the European-American settlement of the land. Long before the 1830s, the native Kickapoo and Osage, and the Lenape (Delaware) from the mid-Atlantic coast had settled in this general area. The Osage had been the dominant tribe for more than a century in the larger region. On the southeastern side of the city in 1812, about 500 Kickapoo Native Americans built a small village of about 100 wigwams. They abandoned the site in 1828. Ten miles south of the site of Springfield, the Lenape had built a substantial dwelling of houses that borrowed elements of Anglo colonial style from the mid-Atlantic, where their people had migrated from. The first European-American settlers to the area were John Polk Campbell and his brother, who moved to the area in 1829 from Tennessee. Campbell chose the area because of the presence of a natural well that flowed into a small stream. He staked his claim by carving his initials in a tree. Cambell was joined by settlers Thomas Finney, Samuel Weaver, and Joseph Miller. They proceeded to clear the land of trees to develop it for farms. A small general store was soon opened. In 1833, the southern part of the state was named Greene County after Revolutionary War hero General Nathanael Greene. The legislature deeded 50 acres of land to John Campbell for the creation of a county seat in 1835. Campbell laid out city streets and lots. The town was incorporated in 1838. In 1878, the town got its nickname the "Queen City of the Ozarks." The United States government enforced Indian Removal during the 1830s, forcing land cessions in the Southeast and other areas, and relocating tribes to Indian Territory, which later developed as Oklahoma. During the 1838 relocation of Cherokee natives, the Trail of Tears passed through Springfield to the west, along the Old Wire Road. By 1861, Springfield's population had grown to approximately 2,000, and it had become an important commercial hub. At the start of the American Civil War, Springfield was divided in its loyalty, as it had been settled by people from both the North and South, as well as by German immigrants in the mid-19th century who tended to support the Union. The Union and Confederate armies both recognized the city's strategic importance and sought to control it. They fought the Battle of Wilson's Creek on August 10, 1861, a few miles southwest of town. The battle was a Confederate victory, and Nathaniel Lyon became the first Union General killed in Civil War. Union troops retreated to Lebanon to regroup. When they returned, they found that most of the Confederate army had withdrawn. On October 25, 1861, Union Major Charles Zagonyi led an attack against the remaining Confederates in the area, in a battle known as the First Battle of Springfield, or Zagonyi's Charge. Zagonyi's men removed the Confederate flag from Springfield's public square and returned to camp. It was the only Union victory in southwestern Missouri in 1861. The increased military activity in the area set the stage for the Battle of Pea Ridge in northern Arkansas in March 1862. On January 8, 1863, Confederate forces under General John S. Marmaduke advanced to take control of Springfield and an urban fight ensued. But that evening, the Confederates withdrew. This became known as the Second Battle of Springfield. Marmaduke sent a message to the Union forces asking that the Confederate casualties have a proper burial. The city remained under Union control for the remainder of the war. The US army used Springfield as a supply base and central point of operation for military activities in the area. Promptly after the Civil War ended on July 21, 1865 Wild Bill Hickok shot and killed Davis Tutt in a shootout over a disagreement about a debt Tutt claimed Hickok owed him. During a poker game at the former Lyon House Hotel, in response to the disagreement over the amount, Tutt had taken Hickok's watch, which Hickok demanded he return immediately. Hickok warned that Tutt had better not be seen wearing that watch, then spotted him wearing it in Park Central Square, prompting the gunfight. On January 25, 1866, Hickok was still in Springfield when he witnessed a Springfield police officer, John Orr, shoot and kill James Coleman after Coleman interfered with the arrest of Coleman's friend Bingham, who was drunk and disorderly. Hickok provided testimony in the case. Orr was arrested, released on bail, and immediately fled the country. He was never brought to trial or heard from again. The period after Reconstruction and into the early 20th century continued to be socially volatile, with whites attacking blacks in the South. Some cities and counties in Missouri, particularly in former slaveholding areas, also had lynchings of freedmen and their descendants. On April 14, 1906, a white mob broke into the Springfield county jail, and lynched two black men, Horace Duncan and Fred Coker, for allegedly sexually assaulting Mina Edwards, a white woman. Later they returned to the jail, where other African-American prisoners were being held, and pulled out Will Allen, who had been accused of murdering a white man. All three suspects were hanged from the Gottfried Tower, which held a replica of the Statue of Liberty, and burned in the courthouse square by a mob of more than 2,000 whites. Judge Azariah W. Lincoln called for a grand jury, but no one was prosecuted. The proceedings were covered by national newspapers, the New York Times and Los Angeles Times. In the immediate aftermath, local Missouri people reportedly issued two commemorative coins. Duncan's and Coker's employer testified that they were at his business at the time of the crime against Edwards, and other evidence suggested that they and Allen were all innocent. These three are the only recorded lynchings in Greene County. But the extrajudicial murders were part of a pattern of discrimination, repeated violence and intimidation of African Americans in this city and southwest Missouri from 1894 to 1909, in an attempt to expel them from the region. Whites in Lawrence County also lynched three African-American men in this period. After the mass lynching in Springfield, many African Americans left the area in a large exodus. In the 21st century, African Americans constitute a very small minority in Springfield and throughout the Ozarks. A historic plaque on the southeast corner of the Springfield courthouse square commemorates Duncan, Coker, and Allen, the three victims of mob violence. During the 1950s, Springfield ranked third in the U.S. for originating network television programs, behind New York and Hollywood. Four nationally broadcast television series originated from the city between 1955 and 1961: Ozark Jubilee and its spin-off, Five Star Jubilee; Talent Varieties; and The Eddy Arnold Show. All were carried live by ABC except for Five Star Jubilee on NBC and were produced by Springfield's Crossroads TV Productions, owned by Ralph D. Foster. Many of the biggest names in country music frequently visited or lived in Springfield at the time. City officials estimated the programs meant about 2,000 weekly visitors and "over $1,000,000 in fresh income." The Springfield Chamber of Commerce once presented visiting dignitaries with an "Ozark Hillbilly Medallion" and a certificate proclaiming the honoree a "hillbilly of the Ozarks." On June 7, 1953, U.S. President Harry Truman received the medallion after a breakfast speech at the Shrine Mosque for a reunion of the 35th Division. Other recipients included US Army generals Omar Bradley and Matthew Ridgway, US Representative Dewey Short, J. C. Penney, Johnny Olson, Ralph Story and disc jockey Nelson King. Springfield is on the Springfield Plateau of the Ozarks region of southwest Missouri. According to the United States Census Bureau, the city has a total area of 82.31 square miles (213.2 square kilometres), of which 81.72 square miles (211.7 square kilometres) is land and 0.59 square miles (1.5 square kilometres) (0.7%) is water. The city of Springfield is mainly flat with rolling hills and cliffs surrounding its south, east, and north sections. Springfield is on the Springfield Plateau, which reaches from Northwest Arkansas to Central Missouri. Most of the plateau is characterized by forest, pastures and shrub-scrub habitats. Many streams and tributaries, such as the James River, Galloway Creek and Jordan Creek, flow within or near the city. Nearby lakes include Table Rock Lake, Stockton Lake, McDaniel Lake, Fellows Lake, Lake Springfield, and Pomme de Terre Lake. Springfield is near the population center of the United States, about 80 miles (130 km) to the east. Springfield has an average surface wind velocity comparable to Chicago's, according to information compiled at the National Climatic Data Center at NOAA. It is placed within "Power Class 3" in the Wind Energy Resource Atlas published by a branch of the U.S. Department of Energy; having an average wind speed range of 6.4 to 7.0 miles per hour. 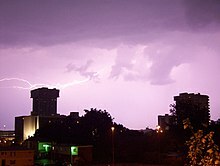 According to a 2007 story in Forbes magazine's list of "America's Wildest Weather Cities" and the Weather Variety Index, Springfield is the city with the most varied weather in the United States. On May 1, 2013, Springfield reached a high temperature of 81 degrees Fahrenheit. By the evening of May 2, snow was falling, persisting into the following day and eventually accumulating to about two inches. As of the 2010 census, there were 159,498 people, 69,754 households, and 35,453 families residing in the city. The population density was 1,951.8 inhabitants per square mile (753.6/km2). There were 77,620 housing units at an average density of 949.8 per square mile (366.7/km2). The racial makeup of the city was 88.7% White, 4.1% African American, 0.8% Native American, 1.9% Asian, 0.2% Pacific Islander, 1.2% from other races, and 3.2% from two or more races. Hispanic or Latino of any race were 3.7% of the population. There were 64,691 households out of which 24.0% had children under the age of 18 living with them, 40.7% were married couples living together, 10.9% had a female householder with no husband present, and 44.8% were non-families. 35.3% of all households were made up of individuals and 11.6% had someone living alone who was 65 years of age or older. The average household size was 2.17 and the average family size was 2.82. In the city 19.9% were under the age of 18, 17.4% from 18 to 24, 28.0% from 25 to 44, 19.8% from 45 to 64, and 14.9% were 65 years of age or older. The median age was 34 years. For every 100 females, there were 92.9 males. For every 100 females age 18 and over, there were 90.0 males. Positronic, Bass Pro Shops, John Q. Hammons Hotels & Resorts, BKD, Noble & Associates, Prime, Inc., Springfield ReManufacturing, and O'Reilly Auto Parts have their national headquarters in Springfield. In addition, two major American Christian denominations—General Council of the Assemblies of God in the United States of America (one of the largest of the Pentecostal denominations) and Baptist Bible Fellowship International (a fundamentalist Baptist denomination founded by J. Frank Norris)—are headquartered in the city. Springfield city government is based on the council-manager system. By charter, the city has eight council members, each elected for a four-year term on a nonpartisan basis, and a mayor elected for a two-year term. The mayor is Ken McClure. Council members include Phyllis Ferguson (Zone 1), Dr. Thomas Prater (Zone 2), Mike Schilling (Zone 3), Matt Simpson (Zone 4), Jan Fisk (General A), Craig Hosmer (General B), Andrew Lear (General C) and Richard Ollis (General D). Jason Gage, the City Manager, appointed by the Council to be the City's chief executive and administrative officer, serves as the chief executive and administrative officer for the City and is responsible for directing the overall operations of the City of Springfield and for executing all policies and programs authorized by City Council. Anita Cotter, the City Clerk, appointed by the council to serve as the Chief of Staff for City Council Members and Custodian of Records, coordinates and responds to all Sunshine Requests and maintains official City records, including minutes, ordinances, resolutions, contracts, and other vital documents. The presiding officer at council meetings is the mayor. Council meetings are held every other Monday night in City Council Chambers. City Council elections are held the first Tuesday in April. City Utilities of Springfield (CU) is a city-owned utility serving the Springfield area with electricity, natural gas, water, telecommunications and transit services. CU provides service to over 115,000 electric, 84,000 natural gas, and 83,000 water customers. Springfield has several colleges and universities. Founded in 1905 as the Fourth District Normal School, Missouri State University (MSU) is the state's second largest university by enrollment, with over 26,000 students. For the seventh consecutive year, MSU was selected for The Princeton Review's 2010 list of "Best Colleges: Region by Region." Drury University is a private university with nearly 5,000 students and consistently ranks in U.S. News & World Report's Top 10 Universities in the Midwest. Ozarks Technical Community College (OTC) is the second largest college in the city of Springfield, having more than 15,000 students in attendance. MSU, Drury, and OTC are all located in and around downtown Springfield. The Springfield-Greene County Park Board manages 3,200 acres and 103 sites, including the Nathanael Greene/Close Memorial Park, which contains the historic Gray-Campbell Farmstead, Mizumoto Japanese Stroll Garden, Master Gardener demonstration gardens, Dr. Bill Roston Native Butterfly House, and Springfield-Greene County Botanical Center; the Rutledge-Wilson Farm Community Park; the Mediacom Ice Park; the Cooper Park and Sports Complex; the Dickerson Park Zoo; and various other public parks, community centers, and facilities. The non-profit Ozark Greenways Inc. promotes trail recreation and local bicycling through the establishment of greenway trails, including a 35-mile crushed-gravel trail, the Frisco Highline Trail connecting Springfield to the town of Bolivar, and smaller trails connecting parks and sites of interest within the town and county. The Missouri Department of Conservation operates the Springfield Nature Center and numerous nearby conservation areas. The National Park Service operates the nearby Wilson's Creek National Battlefield. Springfield's metropolitan area is reasonably well-developed, but situated within close distance of recreational lakes, waterways, caves, and forests, such as the James River, Busiek State Forest, Lake Springfield, Table Rock Lake, Buffalo National River, Ozark National Scenic Riverways, and Fantastic Caverns. Springfield plays host to college teams from Missouri State University (NCAA Division I), Drury University (NCAA Division II), and Evangel University (NAIA). JQH Arena (capacity 11,000) opened in 2008 and is home to the Missouri State Bears and Lady Bears basketball teams, and the O'Reilly Family Event Center, which opened in 2010, is now home to the Drury Panthers men's and women's basketball teams. The Springfield Cardinals, the Double-A affiliate of the St. Louis Cardinals, have played at Hammons Field in downtown Springfield since their inaugural season in 2005 after the team moved from El Paso. A successful team, there have been 100 Springfield Cardinals go on to debut in St. Louis. Springfield has had minor league teams dating back to 1905, and this city has hosted various exposition games. Springfield Rugby Football Club (SRFC) was established in 1983 and is a well-known rugby club in the Midwestern United States. SRFC plays in Division II of the Frontier Region of the Western Conference which runs teams for men, women and youth. The PGA sponsored Price Cutter Charity Championship is played at Highland Springs Country Club on the southeast side of Springfield every year. The event is sponsored by Dr Pepper. Since the event started in 1990, more than $14 million has been raised for local children's charities. Springfield has hosted various sporting events. Missouri State's campus in Springfield has hosted the Missouri Special Olympics several times. Springfield has also hosted the Show-Me Games and regularly hosts the Missouri Winter Games in the sports of racquetball, trap shooting, swimming, volleyball and gymnastics. In 2019 and 2020, Springfield will the host of the NAIA Softball Championship World Series. Springfield has also been the host of the Missouri Valley Conference Baseball Tournament, as well as finals for the Missouri Valley Conference in sports like tennis and volleyball. As a city with a World TeamTennis team, Springfield has hosted final games at Cooper Tennis Complex. Beginning in 2003, Springfield was only one of a thirteen cities in the United States to be a part of the US Olympic Committee's Olympic Development Program. The goal of the program was to develop beginning athletes into elite athletes, with Springfield's program focusing on archery, hockey, tennis and volleyball. Despite the end of the Olympic program in all cities, the city maintains the program as the Community Sports Development Program sponsored by the Springfield Greene County Park Board. Like many cities across the nation, Springfield has seen a resurgence in its downtown area. Many of the older buildings have been, and are continuing to be, renovated into mixed-use buildings such as lofts, office space, restaurants, coffee shops, bars, boutiques, and music venues. The Downtown Springfield CID (Community Improvement District) has historic theaters that have been restored to their original state, including the Gillioz Theatre and the Landers Theatre. In 2001, Phase I of Jordan Valley Park opened along with the Mediacom Ice Park. Phase II of Jordan Valley Park was completed in 2012. 2001 also saw the opening of The Creamery Arts Center, a city-owned building inside Jordan Valley Park. It is home to the Springfield Regional Arts Council, Springfield Regional Opera, Springfield Ballet, and the Springfield Symphony Orchestra and provides office and meeting space for other arts organizations which serve the community. The center has been renovated to include two art galleries with monthly exhibitions, an Arts Library, rehearsal studios, and classrooms offering art workshops and hands-on activities. The facilities also include an outdoor classroom. The Springfield Opera has operated in the city for nearly 40 years. In its history, the opera has performed various well known shows, such as The Barber of Seville, La bohème and Carmen. The Springfield Ballet was founded in 1978 as a not-for-profit to bring ballet to the region. The first performance was held at the Springfield Art Museum in November 1976, and the first public performance in March 1977. The ballet currently performs at the Landers Theatre in downtown Springfield, and has performed with the Springfield Symphony for holiday programs. The ballet is currently headed by a 19 member board of directors representing a range of artistic backgrounds. The Springfield Little Theatre was founded in 1934 and purchased the Landers Theatre in 1970 for its permanent performance venue. The theatre is the oldest civic theatre in Missouri and one of the oldest in the midwest, attended my 60,000 people yearly. Its venue, the Landers, has been the setting for performances by actors such as Kathleen Turner, Tess Harper and Lucas Grabeel. The Springfield Symphony was founded in 1935 and is one of the oldest arts organizations in the city. The symphony was one of the founding members of the American Symphony Orchestra League, now known as the League of American Orchestras, the largest international body for symphonies and orchestras. The symphony performs monthly at Juanita K. Hammons Hall. The Springfield Art Museum was started by a small group of women, headed by Deborah D. Weisel. Within two years of its original founding as an art study club, the museum had been formed and began showing travelling exhibitions from cities like New York and Philadelphia. In 1948, the museum was handed into the control of the city. In 2018, a 30 year plan was revealed with the intent of updating the museum to be comparable to the Nelson-Atkins Museum of Art in Kansas City and Crystal Bridges Museum of American Art in Northwest Arkansas, capitalizing on its central location in the city and adjacent park space. The Missouri Food Truck Festival has been held in Springfield for several years and brings food trucks from Springfield and surrounding states to be sampled for a single event. Like most local events, it includes live music and allows people to travel from one food truck to another to sample various specialties from various cuisines. First Friday is a monthly event held in downtown Springfield that allows local artists to show off their works and encourages people to stroll the streets and art galleries to look at local works of art. The event is sponsored by the Springfield Regional Arts Council and has been a regular event in the city since 2001. Park Central Square, downtown Springfield, where multiple festivals take place yearly. Recently, the city has started to host an annual Route 66 Festival downtown along Route 66 and in Park Central Square. A parade starts the event with a collection of dozens of vintage cars traveling along the former highway. There are also live performances in Park Central Square as people move around St. Louis Street to observe classic cars and browse items from vendors selling artwork and literature about Route 66. The event also holds a 6.6 kilometer run. The 2018 festival lasted two days and was attended by 56,000 people. The Japanese Fall Festival usually takes place in September at the Springfield Botanical Gardens in Nathanael Greene Park. The event is put on by the Sister Cities Association and commemorates Japanese culture, often involving visitors from Springfield's sister city of Isesaki, offering Japanese tea, giving live performances and selling traditional items like Bonsai and kimono dresses. Springfield in turns sends local groups to Isesaki's city festival each year. Several holiday events take place in Springfield, including the yearly Downtown Christmas Parade showcasing local schools and businesses sponsoring floats. There's also a yearly lighting of a Christmas tree at Park Central Square and the Festival of Lights in Jordan Valley Park. During Halloween, locals dance to Michael Jackson's Thriller on Commercial Street to a large audience. Springfield is served by Interstate 44, which connects the city with St. Louis and Tulsa, Oklahoma. Route 13 (Kansas Expressway) carries traffic north towards Kansas City. U.S. Route 60, U.S. Route 65, and U.S. Route 160 pass through the city. 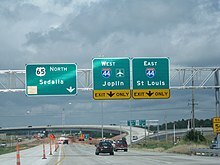 Springfield is also the site of the first diverging diamond interchange within the United States, at the intersection of I-44 and MO-13 (Kansas Expressway) (at 37°15′01″N 93°18′39″W﻿ / ﻿37.2503°N 93.3107°W﻿ / 37.2503; -93.3107﻿ (Springfield, Missouri diverging diamond interchange)). U.S. Route 66 and U.S. Route 166 formerly passed through Springfield, and sections of historic US 66 can still be seen in the city. US 166's eastern terminus was once in the northeast section of the city, and US 60 (westbound) originally ended in downtown Springfield. US 60 now goes through town on James River Freeway. In mid-November 2013, the city began discussing plans to upgrade sections of Schoolcraft Freeway (Highway 65) and James River Freeway (Highway 60) through the city to Interstate 44. The main reason is to minimize confusion should there be an incident on I-44 as a detour route. Springfield-Branson National Airport (SGF) serves the city with direct flights to 13 cities. It is the principal air gateway to the Springfield region. The Downtown Airport is also a public-use airport located near downtown. In May 2009, the Springfield-Branson airport opened a new passenger terminal. Financing included $97 million in revenue bonds issued by the airport and $20 million of discretionary federal aviation funds, with no city taxes used. The building includes 275,000 square feet (25,500 m2), 10 gates (expandable to 60) and 1,826 parking spaces. Direct connections from Springfield are available to Atlanta, Charlotte, Chicago, Dallas, Denver, Destin/Fort Walton Beach, Punta Gorda/Fort Myers, Houston, Las Vegas, Los Angeles, Orlando, Phoenix and Tampa. No international flights have regular service into Springfield-Branson, but it does serve international charters. Passenger trains have not served Springfield since 1967, but more than 65 freight trains travel to, from, and through the city each day. Springfield was once home to the headquarters and main shops of the St. Louis-San Francisco Railroad (Frisco). Into the 1960s, the Kansas City-Florida Special ran from Kansas City to Jacksonville, Florida, and the Sunnyland ran between Kansas City and Birmingham and New Orleans. The railroad also operated two daily trains to St. Louis through Springfield: the Meteor and the Will Rogers. Both continued southwest to Oklahoma City via Tulsa. The Meteor continued on to Lawton, Oklahoma. The Frisco was absorbed by the Burlington Northern (BN) in 1980, and in 1994 the BN merged with the Santa Fe, creating the current Burlington Northern Santa Fe (BNSF) Railway. BNSF has three switch yards (two small) in Springfield. Mainlines to and from Kansas City, St. Louis, Memphis and Tulsa converge at the railroad's yard facility in northern Springfield. In October 2006, BNSF announced plans to upgrade its Tulsa and Memphis mainlines into Springfield to handle an additional four to six daily intermodal freight trains between the West Coast and the Southeast. The Missouri and Northern Arkansas Railroad also operates several miles of (former Missouri Pacific) industrial track in the city. Springfield is a regional medical hub with the healthcare field employing a large number of people in the city. Major care providers include CoxHealth, Mercy, Ozarks Community Hospital and Jordan Valley Community Health Center, with Mercy being classified amongst the top 100 hospitals in the country. The city's healthcare systems offer every specialty listed by the American Medical Association. The industry employs more than 30,000 people in the Springfield metro, and both major hospital systems continue expansions. CoxHealth is based in Springfield and runs five hospitals and several clinics and facilities in southwest Missouri and Northwest Arkansas. The largest of the network's hospitals, Cox South, recently underwent a large expansion on its south tower. Cox also runs a Children's Miracle Network Hospital for specialized pediatric care. Cox has the only hospital in southwest Missouri designate a Level 1 Stroke Center. Mercy Health System, based in St. Louis, is a Level 1 Trauma Center, and runs a pediatric cancer center. Mercy Springfield is one of only six St. Jude Children's Research Hospital affiliates in the country, located inside the Jane Pitt Pediatric Cancer Center. Said center is named for Jane Pitt, mother of actor and Springfield native, Brad Pitt, who helped to fund the center with help from his brother, businessman Douglas Pitt, sister Julie, and then partner, actress Angelina Jolie. Both Cox and Mercy maintain Ronald McDonald House Charities and houses for families of those who have children undergoing medical treatment. The United States Medical Center for Federal Prisoners, one of six federal institutions designed to handle federal inmates' medical concerns, is located at the corner of W. Sunshine Street and Kansas Expressway. Several high profile criminals, including several mob bosses have been housed at the center. Among them, Joseph Bonanno of the Bonanno crime family and John Gotti of the Gambino crime family, who died in the center. The center also housed mass murdererJared Lee Loughner, who perpetrate the 2011 Tucson shooting injuring US Representative Gabby Giffords. In addition to newspapers, Springfield is the base of 417 Magazine, a local lifestyle and entertainment magazine showcasing restaurants, attractions and local businesses in the 417 area code. The Magazine also maintains 417 Biz for business and networking information highlighting local businesspeople and entrepreneurs, as well as 417 Bride for wedding and bridal related content. The Springfield media market ranks 72nd in the nation, amongst markets like Toledo, Ohio and Tucson, Arizona. The area is composed of 31 counties in southwest Missouri and Arkansas. There are 423,010 television-owning households. The city has a history dating back to the 1950s in film and television. Several films, such as the 1952 film The Winning Team starring Doris Day, Frank Lovejoy and future President of the United States, Ronald Reagan, held its premiere in Springfield at the Gillioz Theatre downtown. Reagan, along with his wife Nancy Reagan and President Harry S. Truman were in attendance. More recently, the 2011 film Winter's Bone starring Academy Award winner Jennifer Lawrence, which was set in the region, held a premiere event in Springfield. The film was nominated for four Academy Awards. Springfield hosts the SATO 48 film contest (Springfield And The Ozarks 48-Hour Film Challenge) every spring in which filmmakers have 48 hours to make a film running five minutes or less. The theme of the contest is secret until the final announcement is made, at which point the teams begin planning the film which must be completed within 48 hours. In 2018, a new film festival, Rated SGF, began in Springfield. The event is hosted by the Film and Media Association of Springfield and the Downtown Springfield Association. ^ Official records for Springfield were kept at downtown from January 1888 to December 1939, Downtown Airport from January 1940 to July 1940, and at Springfield–Branson National Airport since August 1940. For more information, see ThreadEx. ^ a b c "City and Town Population Totals: 2010-2017". Retrieved May 26, 2018. ^ a b c d e f "History of Greene County, Missouri". Thelibrary.springfield.missouri.org. Retrieved 2017-04-28. ^ a b c d "A brief history of Greene County, Missouri". www.rootsweb.ancestry.com. Retrieved 2017-09-06. ^ "History of Greene County, Missouri". thelibrary.org. Retrieved 2017-09-06. 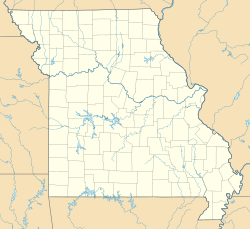 ^ "History of Greene County, Missouri". thelibrary.org. Retrieved 2017-09-07. ^ Creative, Demi. "Greenway Trails | Ozark Greenways". ozarkgreenways.org. Retrieved 2017-09-06. 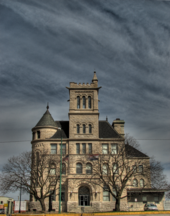 ^ a b c d "Springfield History - Springfield Missouri Travel & Tourism - Ozarks/Midwest Vacations". www.springfieldmo.org. Retrieved 2017-09-06. ^ "Zagonyi's Charge". thelibrary.org. Retrieved 2017-09-06. ^ a b c "Ozarks Afro-American History Museum Online | Springfield: April 14, 1906 · Lynchings and Exodus". oaahm.omeka.net. Retrieved 2016-10-31. ^ "Historic Joplin » Blog Archive » 105th Anniversary of Springfield's 'Easter Offering'". www.historicjoplin.org. Retrieved 2016-10-31. ^ "Missouri Breeding Bird Atlas 1986 - 1992: The Natural Divisions of Missouri". Mdc.mo.gov. Retrieved 2010-10-21. ^ "Wind- Average Wind Speed- (MPH)". 2011-03-03. Archived from the original on 2011-03-03. Retrieved 2017-08-11. 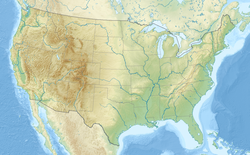 ^ "Wind Energy Resource Atlas of the United States". RREDC - NREL. 1986. Retrieved 15 March 2011. ^ "Average Relative Humidity(%)". NCDC - NOAA. 2001. Archived from the original on 1 November 2001. Retrieved 15 March 2011. ^ Van Riper, Tom (2007-07-20). "In Pictures: America's Wildest Weather Cities: No. 9: Most Variety (biggest variations in temperature, precipitation, wind), Springfield, Mo". Forbes. Archived from the original on 2016-03-10. ^ Haugland, Matt (1998). "Cities with most weather variety". Weather Pages. Retrieved 15 March 2011. ^ "Station Name: MO SPRINGFIELD". National Oceanic and Atmospheric Administration. Retrieved 2016-09-07. ^ "WMO Climate Normals for SPRINGFIELD/REGIONAL AP MO 1961–1990". National Oceanic and Atmospheric Administration. Retrieved 2014-03-11. ^ United States Census Bureau. "Census of Population and Housing". Retrieved July 10, 2013. ^ "Our Community". Coxhealth.com. 2006-09-30. Retrieved 2010-06-08. ^ "The Role of Metro Areas in the U.S. Economy" (PDF). U.S. Conference of Mayors. March 2006. p. 119. Archived from the original (PDF) on 2009-12-16. Retrieved 2009-12-26. ^ "Springfield Business Development Corporation". Business4springfield.com. Retrieved 2010-06-08. ^ "Major Employers | Springfield Regional Economic Partnership". Springfieldregion.com. 2014-06-20. Retrieved 2017-04-28. ^ "Springfield now largest Missouri school district". Springfield News-Leader. 2011-12-14. ^ "Missouri State University sets another fall enrollment record". 20 September 2017. Retrieved 4 December 2017. ^ Miller, Mark (2010-09-28). "Drury University's fall 2010 census reveals record enrollment". Drury.edu. Archived from the original on 2011-07-18. ^ "Drury University: Quick Stats". Drury.edu. Retrieved 2010-06-08. ^ "New students, new spaces at OTC this fall". Otc.edu. Retrieved 2010-06-08. ^ "SBU-Springfield Campus". Retrieved 2017-04-28. ^ "Springfield-Greene County Park Board About Us"
^ "History and Background of Nathanael Greene Close Memorial Park"
^ "Springfield-Greene County Park Board Facilities"
^ "National Park Service - Wilson's Creek National Battlefield"
^ "FAQ's | Springfield Cardinals Content". Springfield Cardinals. Retrieved 2019-03-10. ^ "About". Springfield Rugby Club, Missouri. Retrieved 2019-03-10. ^ "History". Price Cutter Charity Championship. Retrieved 2019-03-10. ^ "Swimming | Missouri Winter Games". missouriwintergames. Retrieved 2019-03-10. ^ "Softball World Series Heads to Springfield, Mo., in 2019 and 2020". NAIA.org. Retrieved 2019-03-10. ^ "2018-19 Championships". mvc-sports.com. Retrieved 2019-03-10. ^ "Missouri Sports Hall of Fame | Inductees". Missouri Sports Hall of Fame. Retrieved 2019-03-10. ^ "CODP". Team USA. Retrieved 2019-03-10. ^ "Community Sports Development Program (CSDP) | Springfield-Greene County Park Board". www.parkboard.org. Retrieved 2019-03-10. ^ "Springfield Ballet :: History". springfieldballet.org. Retrieved 2019-02-20. ^ "Landers Theatre History". Springfield Little Theatre. Retrieved 2019-02-20. ^ "About Us | Springfield Symphony". www.springfieldmosymphony.org. Retrieved 2019-02-20. ^ "About | Springfield Art Museum, MO - Official Website". www.sgfmuseum.org. Retrieved 2019-02-20. ^ "Springfield Art Museum unveils plan to turn site into a world-class attraction". FOX 4 Kansas City WDAF-TV | News, Weather, Sports. 2018-10-13. Retrieved 2019-02-20. ^ "MO Food Truck Fest". MO Food Truck Fest. Retrieved 2019-02-19. ^ "First Friday Art Walk". www.417mag.com. Retrieved 2019-02-19. ^ "Cider Days on Walnut". It's All Downtown. Retrieved 2019-02-19. ^ "Birthplace of Route 66 Festival – Come see where it all started". Retrieved 2019-02-19. ^ "Japanese Fall Festival". www.biz417.com. Retrieved 2019-02-19. ^ "Mercy Hospital named to top 100 hospitals list". Springfield News-Leader. Retrieved 2019-02-18. ^ Partnership (SREP), Springfield Regional Economic. "Data". Springfield Regional Economic Partnership. Retrieved 2019-02-18. ^ "2017 a record-setting year for Children's Miracle Network Hospitals at CoxHealth". www.coxhealth.com. Retrieved 2019-02-18. ^ "Brad Pitt and siblings donate $1 million for pediatric cancer center in honor of mom". Cure Today. Retrieved 2019-02-18. ^ "Sportstvjobs.com". Sportstvjobs.com. Retrieved 2017-04-28. ^ [(https://www.news-leader.com/story/news/local/ozarks/2015/06/07/ozarks-history-truman-reagan-town-debut-film/28660535/ "Reagan, Truman movie premiere"] Check |url= value (help). ^ Landis, Michael. "New film festival to premiere in downtown Springfield". www.ky3.com. Retrieved 2019-02-18.